The book launch for January 1 will be April 19th from 6-7:30pm at the Print Center in Philadelphia. Information about the event can be found here. 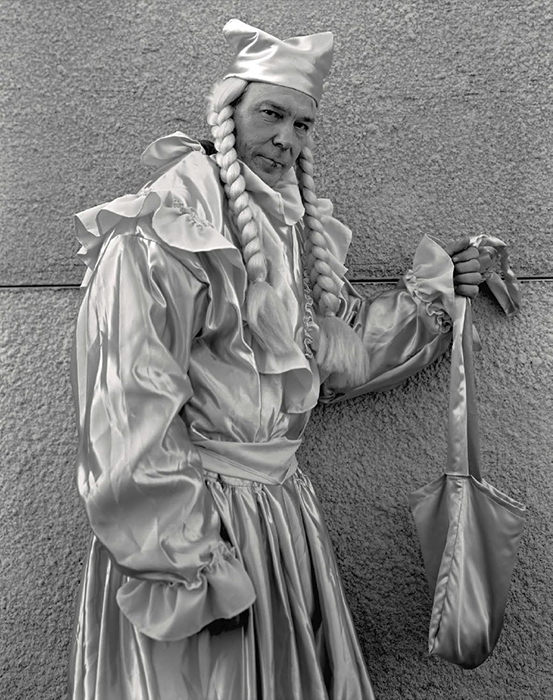 The Skinny: American photographer Andrea Modica’s January 1 presents 8x10 black and white portraits of Mummer Wenches. 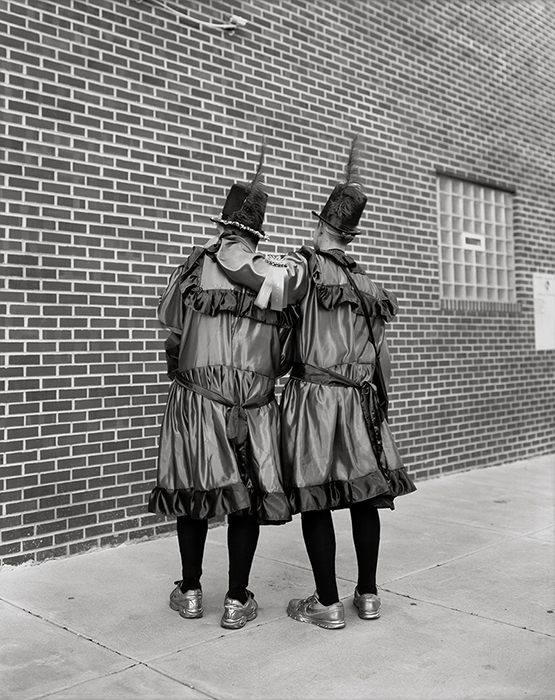 Modica writes that New Year’s Day in South Philadelphia with the Mummers “at times resembles a well-choreographed parade of highly skilled performers, and at other times is more of a sprawling, shambling mob of happy, boozy, (primarily) men in costumes.” The photographs were made every year on January 1st between 2008 and 2018. The book was published by L'Artiere Editions. Review: Modica’s January 1 features an uninterrupted sequence of full-size right hand images that ends with a short text that gives context to the Wenches in the portraits. 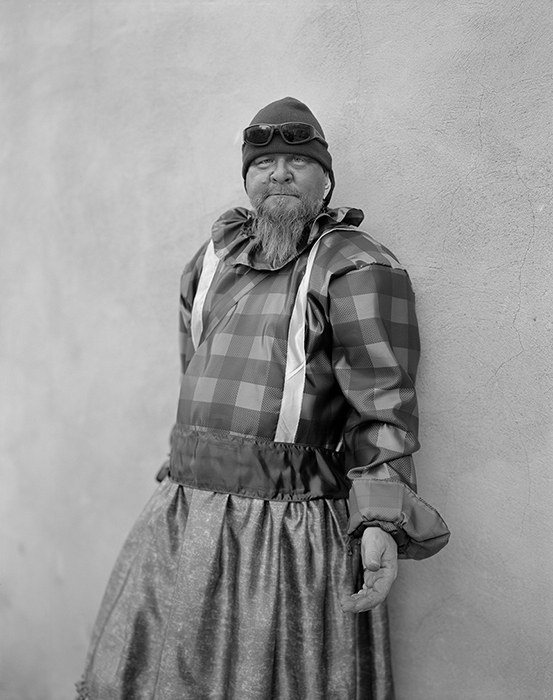 The large format photographs range from full body images to tighter portraits of faces. 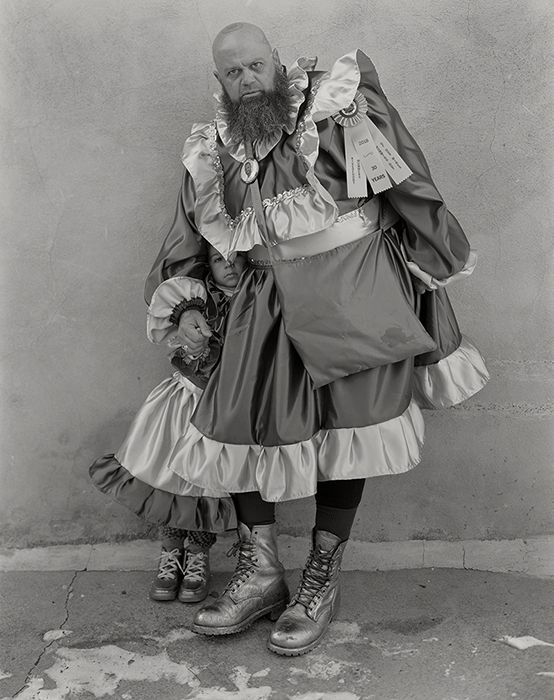 Modica uses this traditional photographic language to explore contemporary questions of masculinity, inclusion and exclusion, and time. 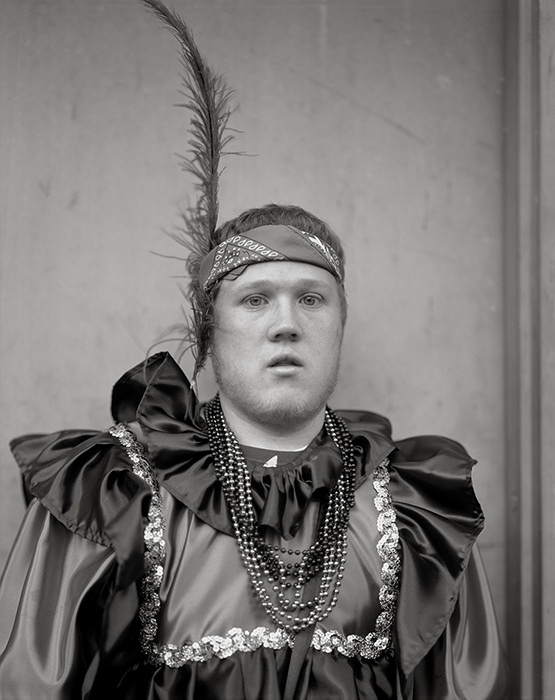 The examination of masculinity may seem to come from the subjects themselves, their dresses and braids. 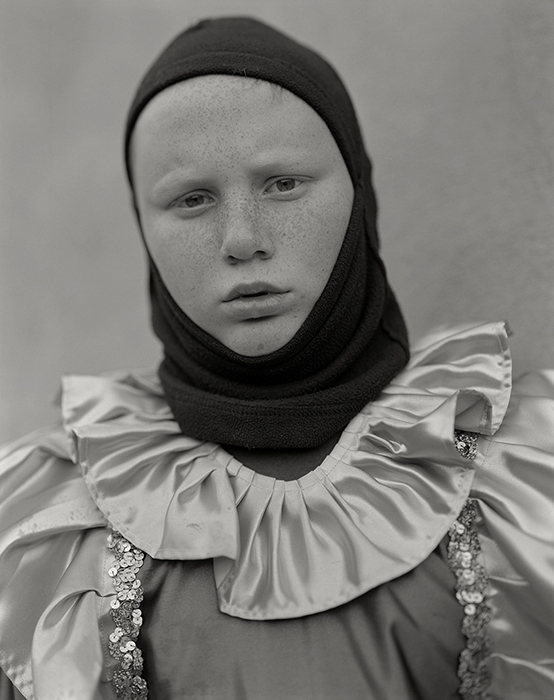 Spending time with the images, however, it becomes clear that it is the uncommon tenderness of Modica’s gaze and camera work that opens and then investigates her subject's masculinity. The soft planes rendered by tilt focus, closed eyes, light shimmering on the fabric of dresses, and the softness of an expression so relaxed that a mouth hangs open combine with other, similar elements to create a sensual connection between viewer and the subjects, a sense of the feminine in men that live in an environment where maintaining a public front of masculinity is the norm. Additionally, Modica pares down her compositions to their essence, and the mastery of her efficiency opens her subjects to us. Her ability to turn the whiteness of a chin, the relationship between fingers held in a fist with braided hair, or the unexpected connection between a boys’ freckles and the sequins of his outfit into a successful photograph connect the subject in the photograph with the viewer by disarming and surprising both of us, and leaving so little between us. As in previous bodies of work such as Treadwell, Minor League, and Best Friends, Modica takes up the idea of inclusion and exclusion in January 1. The cross-dressing Wenches as subject create a sense of inclusion through tolerance and permissibility. At the same time, however, the subjects also appear to create parameters of exclusion through the generally consistent way in which they present themselves which suggests an implicit code. 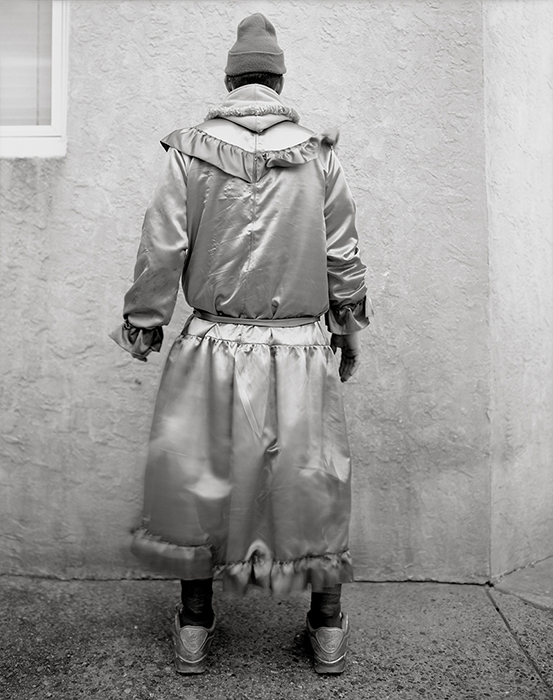 If we image that the full spectrum of cross dressing would include flamboyant drag queens on one side, these subjects stay to the other, and one senses that a fully feminized potential member might fall outside the ring of inclusion among this group of stubbled, beer swilling South Philly men that put on dresses one day a year. 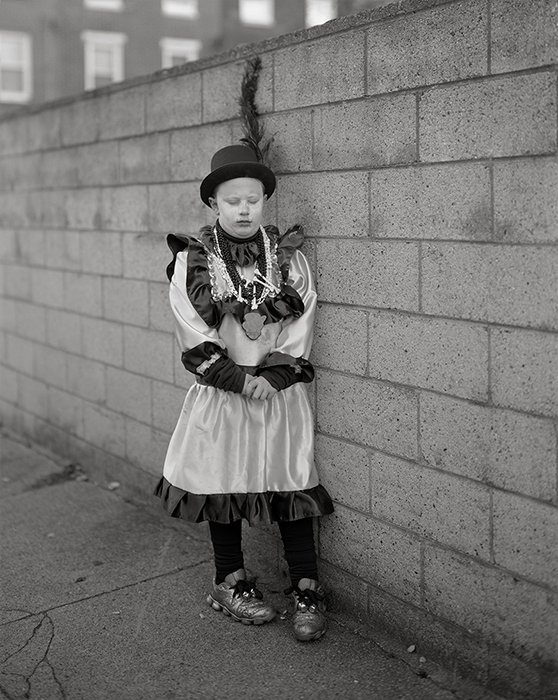 Modica pushes the questions of inclusion and exclusion in two additional ways in how she makes the work. She separates members from their group to highlight their individuality as in Minor League. 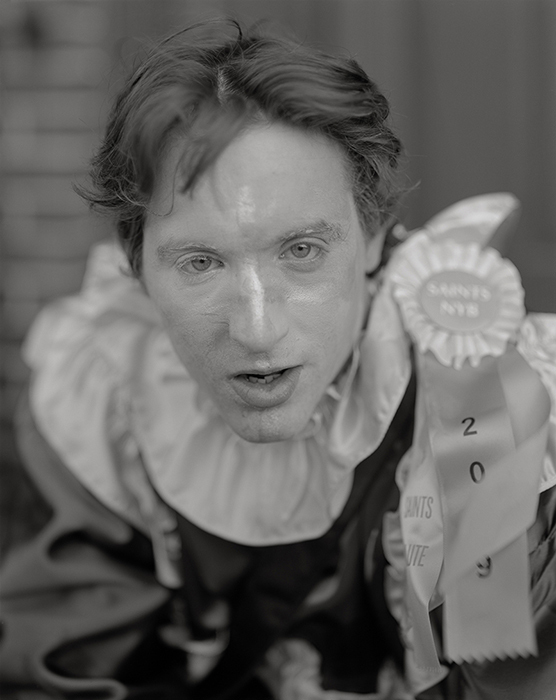 With the Wenches, however, Modica takes the concept a step further by moving into a public event to separate out her subjects for intimate, personal, and what feels like private portraiture. In addition, the book reassembles the individual Wenches into a group, but as selected, ordered, and presented by Modica. This establishes another investigation of inclusion and exclusion, this time through what and – importantly – whom the photographer includes in her frames, and what and whom she excludes, and how she subsequently selects final photographs and sequences them. Modica also explores contemporary ideas of time in January 1. By photographing one day per year over ten years, all the while creating the sense of a single day through the consistency of her formal approach to her images, Modica captures a sense of Nietzche’s Eternal Return, a sense of a single, but recurring existence that we increasing seem to feel today. In contrast, January 1 also explores the idea of time as a spiral, of passing over the same rituals annually as generations move ahead. She does so through through the range of how she presents children her work, giving a sense of how the traditions of the Wenches are passed down. In the portrait of (presumably) a father and child above, we have a clear sense of protection and of the next generation still under the wing. In other portraits of children in the book, especially that of a pigeon-toed boy with his eyes closed, we sense the bird has just left the nest to begin to learn how to carry the group onwards. Modica also plays with time by giving us timeless portraits in conversation with the best of Sander, Ross, or Lange, that include enough of the contemporary world to suggest the tension between the timeless and what dates us: a beer can, sunglasses, a lip piercing, a metal gate, and a winner’s ribbon that includes a specific year. As in much of Modica’s work, January 1 embodies tensions and contradictions that hold the project together and give it structure: the feminine masculine, inclusion through exclusion, the timeless contemporary. These tensions beneath the surface, when combined with her pitch perfect compositions create a lasting, important, and subtly political body of work that, like the best art, gives us something different each time we pick it up.